The NETGEAR WC9500 Wireless Controller is the industry’s first affordable, high capacity, secured wireless controller capable of managing up to 600 Access Points and 36,000 concurrent clients per cluster. The WC9500 delivers ultra-fast Access Point discovery, Layer 2 and Layer 3 fast roaming, multiple 10 Gigabit connectivity, a captive portal for guest access, fully distributed architecture, and ease of configuration and management. Unlike other WLAN systems that are costly, complex and cumbersome to deploy, the WC9500 High Capacity Wireless Controller is ideal for medium to large enterprise, higher education (university and colleges), large hospitals and medium to large size hotels. The NETGEAR WC9500 is designed with simplicity in management and ease of use to enable users to set up the systems in minutes. The product is enterprise-grade and feature-rich, and is secured and high performance. The NETGEAR WC9500 High Capacity Controller supports up to 200 APs and is upgradable in 10, 50, 100, or 200 APs via software licenses. Stackable up to three controllers, a WC9500 High Capacity Controller stack can support up to 600 access points with a single interface. The WC9500 offers redundancy for always-on reliability. Deployed as an overlay on the existing wired network infrastructure, the NETGEAR ProSAFE High Capacity Wireless Controller simplifies the network management by providing a single point of management for the entire wireless network. Easy to set up, the WC9500 Controller discovers all supported access points in the network, even across VLANs and subnets. Once identified, the access points are provisioned in minutes. The discovery process follows an efficient and fast protocol in Ufast. With identity-based security features such as support for RADIUS, Active Directory and internal or external AAA server, the NETGEAR ProSAFE High Capacity Wireless Controller truly unifies wired and wireless access without compromising on security. Management VLAN is configurable and up to 8 security configuration profiles (SSID, 802.11i security, VLAN, ACLs, radio parameters) can be active. Rogue AP detection permits rogue APs classification (friendly or hostile). Standard RADIUS compliance enables support for thirdparty authentication and billing system implementation. Scheduled wireless on/off times permits the wireless network to be completely unavailable during specified nonbusiness hours. Guest access allows restricted access to the network, using an integrated captive portal. Two methods of entry are provided, either assisted or self-certified. In the assisted model, the receptionist can create a user name and password for guests in the GUI and the WC9500 High Capacity Controller hosts a captive portal where guests can enter their pre-configured credentials to gain access to the network. Alternatively, the WC9500 High Capacity Controller hosts a guest portal where guests can register themselves before entering the network. Backend VLAN policies ensure restricted access to guests, prohibiting them any access to the sensitive data on the corporate network. Guest activity logs are available. Automatic control of AP transmit power and channel allocation ensures coverage by minimizing interferences. Automatic WLAN healing after loss of AP or due to RF interferences adapts the power and channel of the other APs around the area. Scheduled automatic channel allocation authorizes an enterprise-class reliable wireless experience. Automatic load balancing of clients across APs is provided based on number of clients per AP and signal strength threshold/data rate threshold of clients on the BSS. Rate limiting is provided by SSID. Load balancing and rate limiting ensure fair bandwidth allocation among all clients for robust wireless connectivity. The NETGEAR WC9500 High Capacity Wireless Controller supports rapid mobility across VLANs and subnets including 802.11i preauthentication and fast roaming support (FRS). Seamless L2 and L3 roaming provides support for latency-sensitive applications such as video, audio and voice over wireless. WiFi Multimedia (WMM) advanced prioritization extends WiFi’s high-quality end-user experience to voice applications (VoWiFi). The WC9500 uses a heartbeat mechanism between the controller and the AP. It is monitored based on several factors, such as RF interference, clients, error levels, etc. Each AP is constantly monitored (number of clients, traffic load, RF interference, packet error levels and retransmission statistics). Statistics provide reliable metrics per AP, per client, per floor and for the entire wireless network. The best of centralized and distributed architectures are implemented by the NETGEAR ProSAFE High Capacity Wireless Controller for outstanding Wireless-N performance. Local traffic is automatically switched at the access points level for fastest processing, when roamed L3 traffic is processed at the controller level with advanced data control. Real-time applications such as VoWiFi require perfect inter-subnet/ inter-VLAN mobility: WC9500 encryption tunneling delivers enterprise-class fast roaming without any impact on Layer 2/Layer 3 performance. 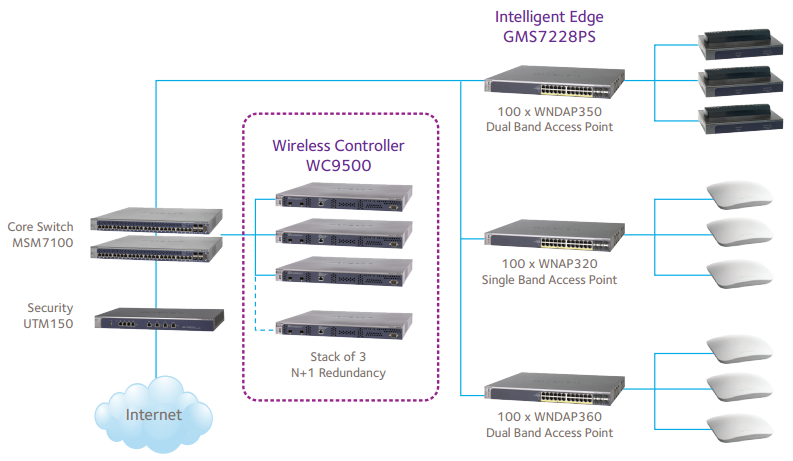 Supporting standard NETGEAR access points, the WC9500 High Capacity Wireless Controller enables customers to select the right access points for their needs, including mixing models to provide the right coverage. The standard access points are converted to dependent access points. 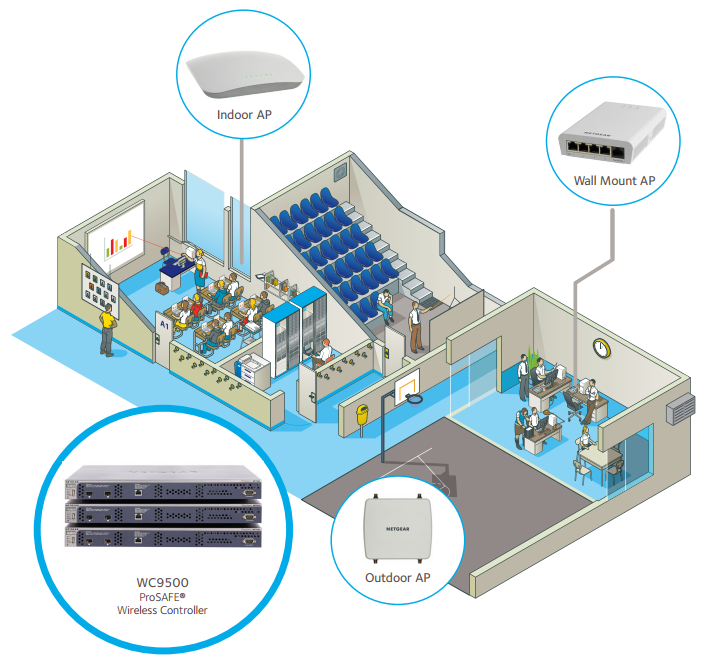 Supported models include professional-class ProSAFE access points WAC730 and WAC720 (802.11ac ultra high performance), WNDAP660 (high performance dual band concurrent), WNDAP620 (high performance dual band selectable) WNDAP360 (dual band), WNDAP350 (dual band), WNAP320 (single band), WNAP210 (single band), WN370 (wall mount single band), WND930 (outdoor) and WNDAP380Rv2 (integrated WiFi and RFID) all with Power over Ethernet capabilities and lifetime warranties. Download the NETGEAR WC9500 Datasheet (PDF).